Object: Careful preoperative planning with thin-slice computed tomography (CT) scan is useful for hardware placement at C2. Prior studies have shown considerable variability in the proportion of C2 vertebrae considered safe for pedicle screw placement, depending on the imaging technique used. Our work sought to more carefully define that proportion using a refined imaging technique on a large number of submillimeter CT scans. 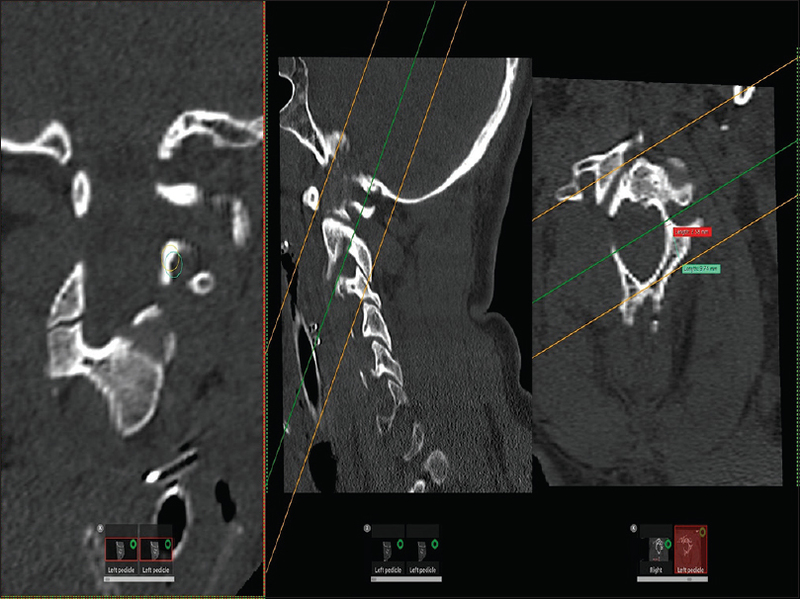 Materials and Methods: We reviewed 150 submillimeter cervical spine studies randomly selected from CT scans performed at a Level 1 trauma center. OsiriX™ image analysis software was used to propagate a 5-mm cylinder through the plane of the pedicle on paracoronal reformatted CT scans. Hounsfield unit attenuation was used to determine whether the cylinder violated the pedicle. Binomial data were generated to determine the proportion of pedicles that would allow safe screw placement. Results: We analyzed 300 pedicles in 150 patients. Using a standard C2 pedicle starting point, 32% of pedicles were breached by the 5-mm diameter cylinder. When screw trajectory was adjusted by moving the cylinder to fit the pedicle isthmus, establishing an optimized starting point, only 14% of pedicles were breached. Average pedicle length was 27.3 mm for screws that would have crossed the isthmus versus 13.2 mm for screws that would have stopped short due to potential breach. Conclusions: Findings of the current work suggest that preoperative imaging analysis or navigation can be useful adjuncts when anatomical variants are present. Anatomical specimen studies suggested approximately 22% of C2 vertebrae have a high-riding vertebral artery that could preclude transarticular screw placement. Bhatnagar et al. used 2.6-mm slice fixed-angle computed tomography (CT) angiograms performed on 47 trauma patients, showing a similar 24% of patients with arterial anatomy that could preclude safe C2 pedicle screw placement. Standard CT imaging may not be the most accurate method of assessment. CT slice orientation can make the evaluation of bony corridors for screw placement difficult because of the multiplane obliquity of the C2 pedicles.,,, Burke et al. retrospectively reviewed CT scans from the same cohort of 47 trauma patients with reformatting in the plane of the C2 pedicle, finding that 98% of pedicles could tolerate at least a 3.5-mm screw. Marques et al. 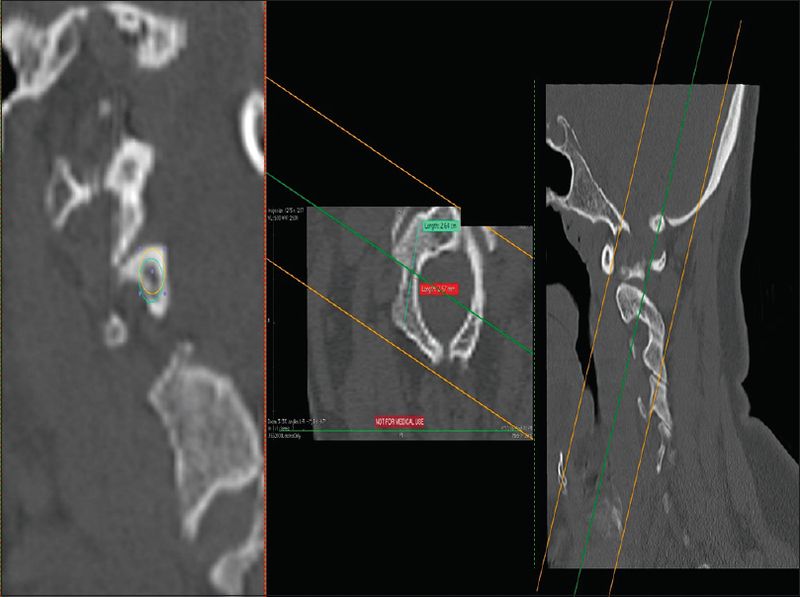 utilized multiplanar CT reformatting for preoperative planning, finding 4 of 5 patients felt to have a high-riding vertebral artery on conventional CT slices were able to accept a 3.5-mm screw. Limitations of prior CT studies include the use of >1-mm CT slice thickness, evaluation of a limited number of scans, and measuring along the pedicle axis rather than the screw axis. Our clinical experience suggests that using a variable starting point and trajectory for C2 pedicle screws allow safe placement in a large majority of patients. We sought to better define the proportion of patients at risk for breach using these preoperative planning and screw placement techniques. We used multiplanar reconstruction on a large number of submillimeter slice cervical CT scans with both fixed and variable starting points to evaluate potential C2 pedicle trajectories. After receiving approval by our Level 1 Trauma Center's Institutional Review Board, 150 adult patient studies performed for multiple indications were sequentially selected from 0.5 and 0.65-mm slice thickness noncontrast cervical spine CT scans. Patients were excluded if they had any of the following: prior or current vertebral artery injury, previous surgery involving C1 or C2, congenital cervical spine fusion such as Klippel–Feil syndrome noted on CT scan, alteration of C1–C2 anatomy related to tumor, or other erosive lesion noted on CT that distorted native pedicle anatomy. We used three-dimensional multiplanar reformatting functions of OsiriX™ free-source Digital Imaging and Communications in Medicine software (version 5.5.2, Pixmeo, Geneva, Switzerland) to evaluate the C2 pedicle. Reformatting was performed in the plane of the C2 pedicle using multiple axis adjustments with pedicle breach determined using paracoronal reconstructions, similar to the two-step technique used by Marques et al. The fixed starting point image analysis used the anatomical data of Xu et al. to define a point on sagittal, axial, and coronal images 5 mm inferior and 7 mm lateral to the transition between the lamina and the medial pedicle. Entrance angle was then determined on axial slices by measuring 2.5 mm from the border of the spinal canal (radius of a 5-mm cylinder, providing a safe zone for 3.5-mm screw placement) and then centering the trajectory on the sagittal views. This allowed reformatting with paracoronal slices following screw trajectory. The 5-mm diameter cylinder was propagated in all reconstructed slices to allow the evaluation of the bony corridor available for screw placement. If the cylinder appeared outside the cortical boundary, Hounsfield units (HU) were measured from a minimum of three points within the circle to confirm decreased density. If these measured <200 HU, they were considered to breach the vertebral artery foramen and preclude screw placement [Figure 1]. Cylinders that reached the C2 vertebral body without breach defined pedicles that would accept screw placement [Figure 2]. For the variable starting point image analysis, we measured pedicle diameters on paracoronal images and then revised the position of the cylinder to center it at the pedicle isthmus. We then propagated that trajectory posteriorly to define the starting point, evaluated for breach along the cylinder axis, counted the number of pedicles that would accept screw placement, and measured screw length. Screw length was defined as extending from the starting point to the anterior vertebral body or the maximum length before breach for screws that violated the pedicle. We analyzed 300 pedicles in 150 patients. There were 100 men and 50 women in the cohort. In the fixed starting point analysis, 32% of pedicles showed a breach when a 5-mm cylinder was used as a safe zone for 3.5-mm pedicle screw placement. However, using a variable starting point defined by propagating screw trajectory from the isthmus decreased the breach rate to 14% of pedicles. In the fixed starting point analysis, 68 (45.3%) patients had anatomy precluding placement of pedicle screws (60% unilateral and 40% bilateral). In the variable starting point analysis, 30 (20%) patients had anatomy precluding placement of pedicle screws (60% unilateral and 40% bilateral). Female patients were less likely to have adequate corridors to place a pedicle screw using the classic methodology with 41% of pedicles being unsafe for screw placement compared to 27% in men (P = 0.014). Approximately 60% of women had at least one pedicle that precluded screw placement compared to only 38% of men (P = 0.011). When allowing for a variable start point, the gender gap decreased but was still present; 19% of pedicles had aberrant anatomy in women compared to 11.5% of men (P = 0.078). Similarly, 28% of women had at least one pedicle that prevented screw placement compared with 16% of men (P = 0.083). The average length of the pedicle screw able to be placed in the patients without aberrant VA anatomy was 27.3 mm. The average length of screw that could be placed in patients with potential breach was 13.2 mm. Upper cervical spine instrumentation techniques have evolved to allow multiple fixation options. Pedicle screws have stable biomechanical properties and are often the preferred C2 fixation technique if anatomy allows.,,,, Anatomical and imaging studies have allowed progress in fixation techniques, and the data in this study contribute to our understanding of C2 pedicle anatomy. Crockard et al. showed 22% of anatomical specimens displayed anatomy that would preclude transarticular screw placement. Studies using standard CT found that around 24% of patients had vertebral artery anatomy that would preclude pedicle screw placement.,, Newer imaging techniques allow reformatting in the plane of the pedicle and have shown different rates of pedicle violation at C2.,,, Burke et al. suggested that 98% of patients have a pedicle width that would allow placement of a pedicle screw versus only 76% in the same cohort when analyzed without reformatting., This study did not evaluate pedicle height and overall screw trajectory and used a limited number of >1-mm thickness CT images. Our study uses a similar multiplane reformatting technique with paracoronal reconstruction in the plane of the pedicle. The reformatting technique and cylinder propagation used in this study allowed careful evaluation of the pedicle width and height and are capable of detecting anatomic variations not appreciated using other imaging techniques. We believe this study provides useful data regarding safe C2 pedicle screw placement compared to prior studies, as we analyzed submillimeter CT scans from a much larger group of patients with a technique that is similar to standard preoperative planning using multiplane reconstruction with or without navigation. Using a variable starting point and screw angle should allow more facile placement of C2 pedicle screws. Using a variable starting point technique, 14% of pedicles in our study had vertebral artery anatomy that would preclude pedicle screw placement. These data appear to fall between data from Burke et al. showing 2% preclusion versus higher numbers from anatomic specimen or standard CT imaging studies showing 22%–25% preclusion.,,, Marques et al. measured height and width at the isthmus but did not propagate a cylinder along the entire screw axis, and only evaluated five patients. All of the referenced CT studies were limited by >1-mm thickness CT slices which likely missed some anatomical detail. With the vertebral artery adjacent to the inferolateral pedicle, our study showed lateral pedicle breach most commonly in the inferolateral quadrant. This is consistent with Naderi et al., who found that the superior pedicle isthmus was wider than the inferior aspect. This could have caused underestimation of pedicles that would preclude pedicle screw placement in the previous studies measuring diameter alone without screw propagation beyond the isthmus. Previous articles have recognized that there are differences between males and females in regard to pedicle anatomy.,,, We again found this to be the case with female patients being less likely to have adequate corridors to place a pedicle screw using both classic and optimized screw trajectory evaluation techniques. This should be taken into consideration when evaluating patients for pedicle screw placement. Limitations of our study include the use of imaging data only, without analyzing postoperative screw placement. We chose a 5-mm circle to provide an adequate safe zone for 3.5- or 4.0-mm pedicle screws which are most commonly used for C2 pedicle fixation, based on previous recommendations. Other authors have used a 4-mm isthmic diameter cutoff for a 3.5-mm screw. A smaller isthmic diameter cutoff may decrease the preclusion rate. However, in reviewing our reformatted images, the diameter of the majority of precluded pedicles was much <4 mm. We believe that the major reason our data show a different number of precluded pedicles is that we analyzed all dimensions along the entire axis of the screw, which has important implications for our understanding of the C2 pedicle safe zone. We also did not determine the feasibility of other screw options in patients with anatomy that precluded pedicle screws. In summary, we describe a technique to evaluate the C2 pedicle using multiplane submillimeter CT reformatting that allows more accurate evaluation of the safety of screw fixation. We agree with Marques et al. that C2 screw fixation is often possible in patients whose anatomy would appear to preclude screw placement. Our data suggest that 14% of pedicles would still be at high risk of breach with optimal imaging and recommend additional caution in patients with variant vertebral artery anatomy. Heggeness MH, Doherty BJ. The trabecular anatomy of the axis. Spine (Phila Pa 1976) 1993;18:1945-9. Schaffler MB, Alson MD, Heller JG, Garfin SR. Morphology of the dens. A quantitative study. Spine (Phila Pa 1976) 1992;17:738-43. Johnson RM, Panjabi MM, Southwick WO. Biomechanical analysis of clinical stability in the cervical spine. Clin Orthop Relat Res 1975 (109):85-96. Harms J, Melcher RP. Posterior C1-C2 fusion with polyaxial screw and rod fixation. Spine (Phila Pa 1976) 2001;26:2467-71. Gallie W. Fractures and dislocations of the cervical spine. Am J Surg 1939;46:495-9. Jeanneret B, Magerl F. Primary posterior fusion C1/2 in odontoid fractures: Indications, technique, and results of transarticular screw fixation. J Spinal Disord 1992;5:464-75. Dickman CA, Sonntag VK. Posterior C1-C2 transarticular screw fixation for atlantoaxial arthrodesis. Neurosurgery 1998;43:275-80. Abou Madawi A, Solanki G, Casey AT, Crockard HA. Variation of the groove in the axis vertebra for the vertebral artery. Implications for instrumentation. J Bone Joint Surg Br 1997;79:820-3. Wright NM. Posterior C2 fixation using bilateral, crossing C2 laminar screws: Case series and technical note. J Spinal Disord Tech 2004;17:158-62. Wright NM. Translaminar rigid screw fixation of the axis. Technical note. J Neurosurg Spine 2005;3:409-14. Brooks AL, Jenkins EB. Atlanto-axial arthrodesis by the wedge compression method. J Bone Joint Surg Am 1978;60:279-84. Lapsiwala SB, Anderson PA, Oza A, Resnick DK. Biomechanical comparison of four C1 to C2 rigid fixative techniques: Anterior transarticular, posterior transarticular, C1 to C2 pedicle, and C1 to C2 intralaminar screws. Neurosurgery 2006;58:516-21. Du JY, Aichmair A, Kueper J, Wright T, Lebl DR. Biomechanical analysis of screw constructs for atlantoaxial fixation in cadavers: A systematic review and meta-analysis. J Neurosurg Spine 2015;22:151-61. Grob D, Dvorák J, Panjabi MM, Hayek J. Dorsal atlanto-axial screw fixation. A stability test in vitro and in vivo. Orthopade 1991;20:154-62. Naderi S, Crawford NR, Song GS, Sonntag VK, Dickman CA. Biomechanical comparison of C1-C2 posterior fixations. Cable, graft, and screw combinations. Spine (Phila Pa 1976) 1998;23:1946-55. Kuroki H, Rengachary SS, Goel VK, Holekamp SA, Pitkänen V, Ebraheim NA. Biomechanical comparison of two stabilization techniques of the atlantoaxial joints: Transarticular screw fixation versus screw and rod fixation. Oper Neurosurg 2005;56 Suppl 1:151-9. Cacciola F, Phalke U, Goel A. Vertebral artery in relationship to C1-C2 vertebrae: An anatomical study. Neurol India 2004;52:178-84. Bhatnagar R, Yu WD, Bergin PF, Matteini LE, O'Brien JR. The anatomic suitability of the C2 vertebra for intralaminar and pedicular fixation: A computed tomography study. Spine J 2010;10:896-9. Smith ZA, Bistazzoni S, Onibokun A, Chen NF, Sassi M, Khoo LT. Anatomical considerations for subaxial (C2) pedicle screw placement: A radiographic study with computed tomography in 93 patients. Clin Spine Surg 2010;23:176-9. Lee SH, Park DH, Kim SD, Huh DS, Kim KT. Analysis of 3-dimensional course of the intra-axial vertebral artery for C2 pedicle screw trajectory: A computed tomographic study. Spine (Phila Pa 1976) 2014;39:E1010-4. Burke LM, Yu WD, Ho A, Wagner T, O'Brien JR. Anatomical feasibility of C-2 pedicle screw fixation: The effect of variable angle interpolation of axial CT scans. J Neurosurg Spine 2013;18:564-7. Marques LM, d'Almeida GN, Cabral J. “Two-step” technique with osiriX™ to evaluate feasibility of C2 pedicle for surgical fixation. J Craniovertebr Junction Spine 2016;7:75-81. Ebraheim N, Rollins JR Jr., Xu R, Jackson WT. Anatomic consideration of C2 pedicle screw placement. Spine (Phila Pa 1976) 1996;21:691-5. Wajanavisit W, Lertudomphonwanit T, Fuangfa P, Chanplakorn P, Kraiwattanapong C, Jaovisidha S, et al. Prevalence of high-riding vertebral artery and morphometry of C2 pedicles using a novel computed tomography reconstruction technique. Asian Spine J 2016;10:1141-8. Resnick DK, Lapsiwala S, Trost GR. Anatomic suitability of the C1-C2 complex for pedicle screw fixation. Spine (Phila Pa 1976) 2002;27:1494-8. Xu R, Nadaud MC, Ebraheim NA, Yeasting RA. Morphology of the second cervical vertebra and the posterior projection of the C2 pedicle axis. Spine (Phila Pa 1976) 1995;20:259-63. Naderi S, Arman C, Güvençer M, Korman E, Senoǧlu M, Tetik S, et al. An anatomical study of the C-2 pedicle. J Neurosurg Spine 2004;1:306-10.